Delta Force Paintball is the world’s largest operator of paintball games. We have become the biggest and the best by offering the customer exactly what they want, and paintballing in Bonneys is no different. 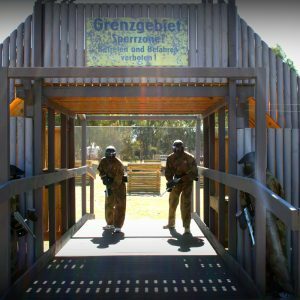 Our paintball centre in Bonneys, located less than 30 minutes from Perth CBD, is the latest facility to hit the Australian paintball scene. 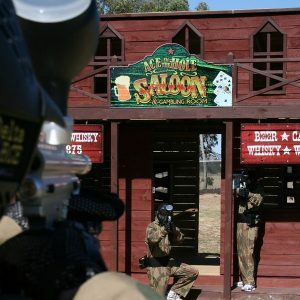 It combines the lush Australian bush with an incredible amount of movie-set structures and props to create the ultimate paintballing adventure. You will need to use your wits and skills to overcome the enemy. Attempt to pass the giant sphinxes and enter the pyramid to capture the ancient relic, or intercept the terrorists before they successfully attack your military communications base. Will you be able to carefully execute a plan to enter enemy territory and bring back a wounded soldier? As with any game of paintball, strategy and teamwork are the two fundamental criteria in order for your team to be victorious. However at Bonneys this is taken to a whole new level. There are various attacking options on every field so you will always need to be on the move, ready to make your next strike. Do not get stuck in the same position for too long, otherwise the enemy will advance and you’ll most likely find yourself between a rock and a hard place quite quickly. Our game zones are world-renowned; constantly making the headlines in every city we open a new centre. The latest Delta Force centre opened in Auckland just a few weeks ago and has already made the tabloids. Be it our world-class game zones, state-of-the-art equipment or professional staff, every week players in Perth and around the world are taking on the Delta Force challenge. We have raised the bar for the Australian paintball industry and we will continue to improve on our already amazing facilities. It really is the ultimate Perth paintballing adventure! 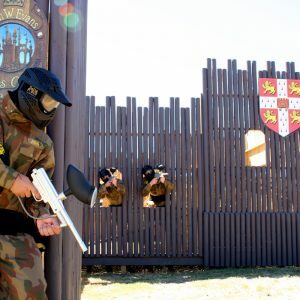 Contact us today on 1300 850 744 for the most action packed paintball event in Perth.